The previous owners of the house left several unknown-to-us shrubs in the backyard. Two of them now have these dark orange berries that look like they're getting "squeezed" from their pods. Can anyone help me identify what plant this is? Please? Looks like some bittersweet vine to me. It usually is a vigorous grower. Sound familiar? Thanks, Carol! My mother-in-law would love it if it's bittersweet. She loves that plant, but can't grow it in Georgia. Apparently it needs cold weather to keep it going?? I don't know what it is, but your picture is gorgeous! my guess is a bittersweet as well. but be careful. american bittersweet is cool but i think the oriental bittersweet is considered an invasive species. good luck in identifying it. It is a lovely photo but I don't know what it is. I don't know as well but. I do like the photograph. I would not guess bittersweet because it usually has a yellow component to the berries, unless it is the native american variety, and is definitely a vine. I wonder about a couple things - first Euonymus americana (quaintly named hearts a'bustin'), or could it be Manhattan euonymus, which will berry when mature. I really can't tell for sure; trying looking those up in more detail to see if they might match! Definitely not bittersweet--I have a lot of that. It is a vine and the leaves don't look like that. Actually the berries don't really look like that either :) 'Tis a mystery! I have a pic of bittersweet on my current blog post and have lots of it growing wild in my wild areas. I'm not sure what this is either, but it grows everywhere in memphis and the birds love it. It does not seem to be invasive, but a good hedge plant. Thanks, everyone, for your relies. I think mine is the Euonymus manhattan. The berries look like the ones in those photos you sent me, Nicole (thank you!). The seed pods are not as red and bumpy like the americana variety (whose name - hearts a' bustin' - I just love, by the way). So, mystery solved! And I learned a thing or two about bittersweet, too. Also, along the way, I found this Shrub Index from The University of Tennessee Dept. of Plant Sciences. It even includes audio files on how to pronounce the latin names, so now I know how to pronounce euonymus! 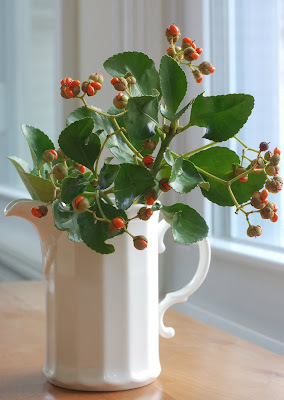 I would have said 'Pyracantha', only because after my family moved to North Carolina, my grandfather said every plant we saw and couldn't identify was a pyracantha. So now it's just a running joke around here. I'm glad you found out what it is, since my suggestion (obviously) shouldn't be taken seriously! Bittersweet isn't evergreen, so I don't think that's what it is. But it's beautiful. Any chance that you could contact the former owners to give you a garden tour and tell you about the various shrubs and perennials? Good idea, but now the previous owners live in Florida. There are several new-to-me shrubs, trees, plants around the house. I've got a lot to learn! Beautiful photos. I really love the first one with the branches in the silvery vase. Christa, I adore that photo of the twigs from the pear tree!! That is spectacular! The backlighting was also great for your perky begonia leaves. Imagine it blooming after a 10 year sabbatical :) Lovely. PS: I was here back on GBBD but could not get the comments to work -- I HAD to return to let you know about those twigs! A tree half empty, or half full?